You'll be £14.99 closer to your next £10.00 credit when you purchase Very Special Intelligence (2015). What's this? The Operational Intelligence Centre (OIC) was the nerve centre of the British Admiralty in World War II, dedicated to the collection, analysing and disseminating of information from every possible source that could throw light upon the plans and deployment of German naval and maritime forces throughout the War. This highly readable account tells the story of how the results of Enigma decoding at Bletchley Park and other intelligence was used mainly in the titanic struggle against the U-boat menace. In the OIC operations room beneath the Admiralty, teams sifted through a combination of radar direction tracking information, secret reports of U-boat departures from the French ports, code-breaking from Bletchley, as well as information from the Americans and Canadians, often contradictory, to anticipate and counter the U-boat threat; and Godfrey Winn, in charge of U-boat tracking, was said to be able to almost read the mind of Dönitz. Through the author's experiences of this intelligence world his riveting story adds a new dimension to those dramatic episodes such as the hunt for the Bismarck, the tragedy of Convoy PQ17, and the long war against the U-boats in the wastes of the North Atlantic, and other naval events that were critical to the outcome of the War. This book remains the only full account of the OIC. Although it occupies an early place in the now considerable literature on signals intelligence in the Second World War, it remains a work (to paraphrase Gardner’s appreciation) of intimacy, breadth and balance. Seaforth’s new edition is most welcome. We have here a very welcome 2015 Seaforth reprint of the 2000 edition that included an introduction by WJR Gardner (author of 'Decoding History: The Battle of the Atlantic and Ultra'), and an 'Afterword' by Ralph Erskine, co-author of 'The Bletchley Park Codebreakers', covering the rock-strewn history of British, German and US WWW2 cryptanalysis, and explaining the practical difficulties of improving our own coding methods. There is a rich bibliography. used and developed operational intelligence, then you must read this book first. It is after all how their nerve centre functioned. This paperback edition of ‘Very Special Intelligence’ has been re-issued, the original book was written by Patrick Beesly and published by Hamish Hamilton in 1977. 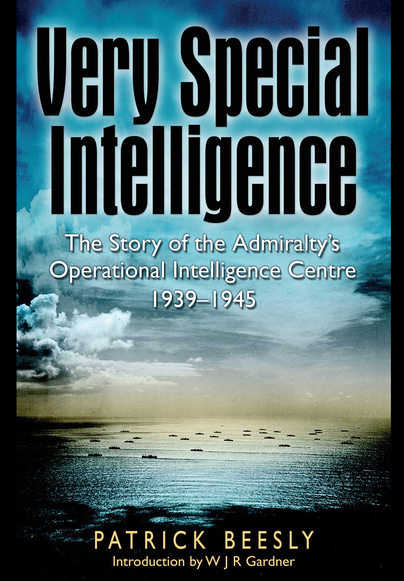 I have always been interested in the story of the Admiralty’s Operational Intelligence Centre. It was a joy to receive this book from Pen and Sword for review. This 289 page edition covers many of the major Naval events in World War Two which you may have heard of and probably an equal number of which you will be totally unaware. The allure of this book and the high esteem in which it is held by Naval historians, goes a long way to explain why it was re-printed in 2000 and again 2006. Beesly wrote ‘Very Special Intelligence’ at a time when the general public’s knowledge of Ultra intelligence was virtually nil. It is important the reader digests this book with the benefit of hindsight. Obviously, in 1977 the author was very restricted in what he could say about Ultra. Many clandestine events alluded to in this book have since been exposed. A large amount Ultra secrets have now been revealed, especially after the declassification and release of mountains of highly sensitive Ultra intelligence over the intervening decades. However, the restrictions imposed on the author in 1977 does not detract from the importance of this book as a historical portrayal, highlighting the internal workings of British Naval intelligence in World War Two. It’s really interesting to read how, with the help of Bletchley Park, the Admiralty was kept very well informed of the movements and intentions of the enemy. Personally, I was totally unaware of the vast amount of principal ciphers types used by the German military. This fantastic book details thirteen of them. This story of the Admiralty’s OIC between 1939 and 1945 is immensely intriguing. Within the pages of this timely re-issued book, the reader will discover that even in 1977 - thirty two years after the end of World War Two - the methods used to collate and decrypt this very special intelligence was still not completely revealed to an oblivious post war nation. This book is a real treat for anyone interested in this vital part of the Naval War during WWII and is really well written by a man who is clearly an authority on the matter. Certainly one of the best books on the matter ever written. .. highly recommended. This is the best book so far and likely to remain so, about British naval intelligence in World War II. Unlike its predecessors it does not deal merely with how the intelligence was gathered but also with how it was used.